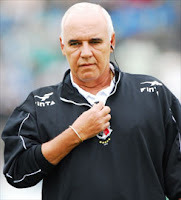 Vasco da Gama have moved quickly to replace Celso Roth, appointing Valdir Espinoza as manager for the remaining six games of the Brazilian league season. Espinoza will have the job of securing Vasco's position in the top flight, with the Rio de Janeiro side currently only five points ahead of Corinthians, who occupy the last relegation place. It is unknown whether Espinoza will be considered to take on the job full time once the season finishes, or whether Vasco have another manager lined up to take over at that time.